Rick (Andrew Lincoln) has sunk to a new low. After last week’s episode of silent zombies and fences that couldn’t be shot through, I was determined to go into this week’s episode of The Walking Dead with an open mind. I wanted to look for the good, I really did. Instead, I got a brutal, nihilistic reminder of the show’s most fundamental problem: Rick Grimes. I honestly don’t think I’ve ever been more upset by an episode of The Walking Dead, but I’m leaving my personal opinion out of it this time. No sarcasm, no jokes, no profanity, not even any anger—this is a look at this episode purely unto itself and the series as a whole. When I say it’s a thorough, uncompromising look at how low Rick will stoop so he can kill everyone he feels is an enemy, regardless of circumstance, I don’t say that as a value judgment, I mean it as an objective fact. “Still Gotta Mean Something” follows Rick and Morgan as they chase down the Savior prisoners who escaped from the Hilltop jail last week. Alden, the Good Ex-Savior, asks Rick to try not to kill too many of them; he explains a lot of them probably made a snap decision during the zombie attack, and they probably already regret it. Now that they’ve had a chance to think about it, Alden figures, most of them probably want to come back to Hilltop. Rick says nothing. Alden is 100 percent correct. After he and Morgan get captured, Rick wakes up in an abandoned bar where the former prisoners are arguing with each other whether they should continue onto Sanctuary, where Simon has already made it clear they will not be welcome, or back to Hilltop, where they were imprisoned but treated with mercy, despite being the enemy. They also have several wounded men and believe Hilltop’s doctor might help them. Jared, the long-haired Savior who has always been the most belligerent prisoner (and the person who killed Henry’s brother) votes for Sanctuary; most of the rest want to return to Hilltop. Rick tells them that a herd is closing in on the bar, and promises that if they untie him, he will let them come back to Hilltop. His truck is nearby and can help carry the wounded. When the not-really-Saviors-anymore can’t decide and the herd arrives, Rick says they’ll need his and Morgan’s help to survive, and they’re freed. Rick and Morgan battle the zombie herd alongside them, for a bit, but soon start murdering the ex-Saviors as well. They are too shocked by the betrayal in the middle of what is already a life or death situation to fight them, and they all die, either by Rick’s hand, or Morgan’s spear, or the zombies (who also eat all the wounded). The murders of these men are not unusually graphic for the show, but they are certainly among the upper end of the scale. Once it’s over, Rick crouches down next to a man dying in a pool of his own blood. “We could have lived,” he manages to croak just before Rick, enraged that this man has not died yet, shoots him in the head. Pictured: Zombies. Not pictured: The real threat. I’ve talked a lot about Rick becoming—or being—a villain over the course of The Walking Dead, but let me put it more clinically: Rick’s actions here are either just or unjust. Either you feel that Rick is justified in killing every Savior, former Savior, or suspected Savior he sees for the greater goal of protecting his people and in pursuit of vengeance, or you think he isn’t. 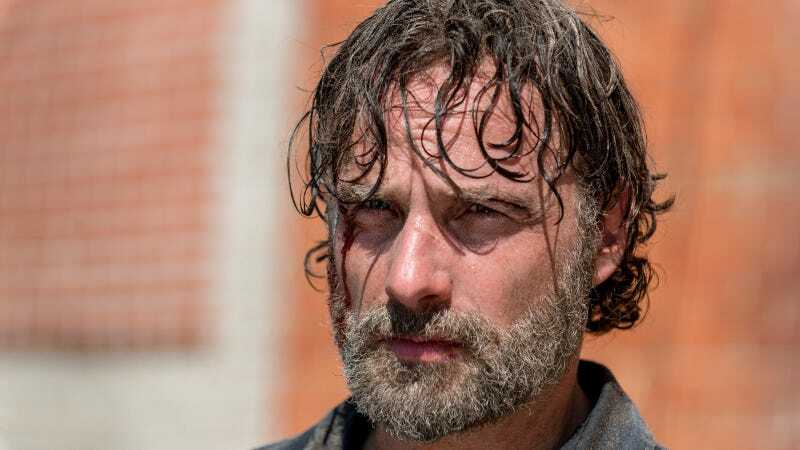 The Walking Dead often presents Rick’s actions, no matter how traditionally immoral they may be thought of, as justified, whether because of the zombie apocalypse he lives in or because of specific threats he’s fighting. Certainly, the other main characters rarely have any feelings other than mild discomfort at the lengths Rick will go to for this. For instance, other than a brief, single, mild questioning from Michonne, there have been zero repercussions, even verbal, for Rick lying to his dying son about how he would try to make peace with the Saviors. But The Walking Dead does know Rick’s actions are immoral, even if the characters somehow don’t. It could not have been an accident that we saw Rick at his most awful, his least honorable, and most murderous in last night’s episode at the same time we watched Negan connect with Jadis on a personal, empathic level of shared loss and grief. Or how Morgan has been continually represented as descending into a psychopathic madness, and yet in this episode, Rick and Morgan do the exact same thing—the only differences being that Rick doesn’t see imaginary people and Morgan doesn’t lie to the men. In fact, the ironic “Still Gotta Mean Something” episode title wants us to focus on Rick’s lies, how his word doesn’t mean anything, and how he’ll do anything to kill the people he’s decided need to die. Rick has no honor and he doesn’t care. The question is: Why? Why turn the main protagonist of this show into a liar and a butcher? The easy answer would be if The Walking Dead was if a show about a man’s descent into villainy, such as Breaking Bad or House of Cards. Yes, it would be ridiculous for the series to have transitioned into this at some point without someone acknowledging this is where the show was heading, but it would be an explanation. Of course, the difference is that those two shows carefully and thoroughly examine their main characters, see them as humans beyond their immorality, and look at their motivations and histories and what led them down their path. The Walking Dead isn’t deft enough anymore to examine its characters beyond an episode or so every half-season. The only other answer is that the show is taking Rick to his absolutely lowest level, his most depraved and indifferent self, in order to redeem him later. The problem with that, however, is the show doesn’t seem to know when “later” is. Rick has been becoming increasingly bloodthirsty and decreasingly relatable since season five, when he led the sneak attack on the Savior outpost and killed all the Saviors inside, unprovoked. He’s ignored the dying wishes of his son earlier this season, and his lies to and murders of the men who were no longer his enemy last night somehow felt even more depraved. The show appears to have no idea what to do with Rick other than make him more and more awful, to the point where the character has become an enormous albatross on the show. While other characters have new goals and challenges and motivations, Rick is laser-focused on killing Negan and everyone Negan knows, over and over, episode after episode. Watching Rick’s nihilist quest for vengeance is reductive and, more importantly, boring. As Carl astutely pointed out, killing only begets more killing, and all Rick is achieving is ensuring the people at Sanctuary cling even tighter to Negan for protection. The war can’t and won’t end with Rick like this. None of the other characters can move forward with Rick like this. The show can’t move forward with Rick like this. Rick needs to die, or The Walking Dead will. I suppose there’s an alternative in that the show could finally redeem Rick, but I honestly don’t know if that’s possible at this point. I do know that new showrunner Angela Kang is coming on board next season with a mandate to return The Walking Dead to be more like it was in seasons four and five, when the series was at its best (and had its highest ratings), according to an interview with executive producer Greg Nicotero. But whether that involves Rick coming back from the dark side or not is anyone’s guess. In fact, whether that needs to involve Rick at all is a question worth asking. • Maybe it’s just because of the alternative, but I found the scenes between Jadis and Negan very compelling. Negan is genuinely sorry that her people were massacred, and promises to make it right by killing Simon, the man responsible. When Jadis is about to burn Lucille, Negan manages to grab her photos of the Trash People and threatens to burn them with a flare. But Negan is the one who defuses the situation by opening up about his wife Lucille, and how the bat and Jadis’ photos are their last connections to people they love. It’s Negan at his most human and most humane, which, again, is no coincidence. • Jadis was going to be picked up by that helicopter that’s been flying until a scuffle with Negan knocks that flare into a puddle of water. This is very mysterious, and I genuinely wonder why Jadis chose to live in garbage if she had a free ticket out of there. • That insane cart with the zombie impaled on the front that Jadis wheeled out both baffles and delights me. • Turns out Henry chased after the escaped prisoners and didn’t catch any and Carol saved him about 12 seconds before he was eaten by zombies. • When Rick returns to Hilltop, having clearly murdered all the escaped prisoners, he haltingly tells Michonne he’s sorry, because he knows he’s done something wrong. “You don’t have to be,” she replies. Michonne, respectively disagree.